The life forms living hear hydrothermal vents, unlike any other life forms on Earth, do not rely on photosynthesis and the sun for their energy but on chemicals coming from beneath the surface of the earth. Of the estimated 500,000 to 10 million species living in the deep sea, the majority are yet to be discovered. Approximately 98% of the oceans’ species live in, on, or just above the floor of the sea. The estimated number of seamounts ranges from 30,000 to 100,000. Seamounts are home to a breathtaking array of species (for example, over 850 species were found on seamounts in the Tasman and Coral Seas). 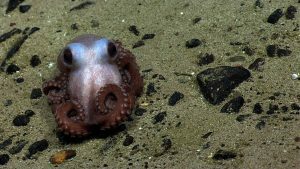 15% or more of the breathtaking array of species being found on seamounts may be long lived, meaning that they are unique to that area. Because of this, each unsampled seamount is a potential source of numerous undiscovered species. The Coral and Tasman Sea seamounts have endemism rates of about 30%. Two-thirds of all known coral species live in waters that are deep, dark, and cold — some live three miles deep and are able to survive in -2°C. Some cold-water corals are 5,000–8,500 years old or more, and some grow into beautiful structures that rise up to 35 meters high. 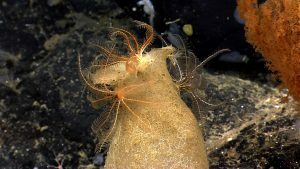 Deep-sea corals, sponges and other habitat-forming organisms provide protection from currents and predators, nurseries for young fish, and feeding, breeding, and spawning areas for hundreds of thousands of species. Commercially important deep-water fish and crustacean populations found in the high seas include crabs, shrimp, cod, Pacific cod, orange roughy, armorhead, grenadier, Patagonian toothfish (aka Chilean sea bass), jacks, snappers, porgies, sharks, groupers, rockfish, Atka mackerel, and sablefish. Deep-sea species tend to be slow growing, late maturing and low in reproductive capacity. Many deep-water fish species live 30 years or more. Some, such as orange roughy, can live up to 150 years. Because deep-sea species live in rarely disturbed environments and tend to be slow growing, late maturing and endemic, they are exceptionally vulnerable to extinction. seafans contain high concentrations of prostaglandins (compounds used to treat asthma and heart disease). Ancient deep-sea corals provide valuable records of climate conditions that may assist our understanding of global climate change.